From the minute you enter the store our aim is to make you feel relaxed and enjoy your whole experience. If it’s your first try of Wedding gowns, to some it can be a daunting task so one of our trained bridal consultants will ask you some brief background to your wedding plans. We will start by trying 4-5 key shapes to enable us to assess the right shape for you, even down to the finer but equally important details such as colour, neckline shape and proportions. We will listen to your thoughts and ideas but we may also throw in a few of our own that you may not have considered. If you then find what you think is ‘the one’, we will ask you to revisit to retry and make sure. We NEVER pressurise anyone into making rushed decisions. Having trained and become a highly succesfull beauty therapist working within highly regarded salons within the North West for over 12 years, Devs caring and understanding manner has been carried forward into the bridal industry. Having managed Cheshire Brial Wear for four years, Devs creative eye for helping brides choose their gowns is second to none. Her expertise on what suits and fits brings every brides dreams into reality. Her friendly and calming manner puts every girl at ease. Having changed her career in banking to bridal, Lindas 12 years of bridal experience has given her the confidence to express her passsion and honesty when choosing gowns. With her bubbly personality and artistic flair she guarantees to make your whole journey exciting and memorable. Lindsey trained at The Northern Ballet School and successfully worked as a production manager and dance captain for many years. Helping performers to fulfill their ambition. She has now carried her artistic flair and creative knowledge into the bridal industry. Lindseys understanding on a brides needs makes a girls wishes a reality. She helps them live her dreams, just as she has done. As this is a one-off event in your lifetime- for most brides this will be the first & last time they go through this process. Below are some of the frequently asked questions we get asked with hopefully some useful answers! Why buy my Gown from Cheshire Bridal Wear? From the minute you enter the store our aim is to make you feel relaxed and enjoy your whole experience. We will start by trying 4-5 key shapes to enable us to assess the right shape for you, even down to the finer but equally important details such as colour, neckline shape and proportions. We will listen to your thoughts and ideas but we may also throw in a few of our own that you may not have considered. What do I bring with me to try dresses on? If you have one a strapless bra or good fitting normal bra. Shoes aren't essential but if you have a particular heel height you like or already have your shoes please feel free to bring them. How long does it take to order my Gown? Most gowns are manufactured to order and therefore require 6 months ordering time. We do work with UK Designers which in some cases allows us to order dresses in less time and some of our other suppliers hold some stock & some for a small chatge can do rush-orders. We also hold a range of ex-sample gowns which are available ‘off-the-peg’. How do I pay for my wedding dress? To assist our customers we have introduced a choice of payment terms to assist with your wedding budgeting & to help spread the cost. These are all interest free. Please ask one of out Bridal consultants for further information. Why buy my Gown from a Bridal Shop rather than the internet? As with most purchases customers shop around for the best deals. Buying your wedding gown is no exception and at the end of the day as a consumer you have a choice to make. Buying from Ebay or direct from Chinese factories offering the product you may have seen in-store at a fraction of the price is very tempting. However, none of our suppliers sell directly to the public through the internet and therefore the product you will receive will be a ‘knock-off’ version of the original with incorrect sizing, cheap fabrics & embellishment. What happens to my dress once it arrives from the manufacturer? Ordering times permitting we always endeavour to have the gowns in store 2/3 months prior to the date of the wedding. Fittings are carried out approx 8 weeks before the wedding and the final fit is approx 3 weeks before. We store all the gowns in our specially designed stock room until the week of the wedding when we will press or steam the gown ready to be worn. No dress will leave the store unless it is perfect. During the fitting appointments you will be able to order any accessories if required and we will also invite whoever will be dressing you to advise the best way of doing it to avoid any panic stations on the day. If any bride or Mother of the Bride is still concerned about this we offer our Gold Service. For a small fee, (location and availability permitting) we will go to the Bride’s home and dress her and make sure the gown is perfect. Please enquire about this with a member of staff. If i'm getting married abroad, how do I transport my dress? We always advise to follow the airlines guidelines. Generally we will ask you to supply a suitable suitcase & then after steaming will pack the gown for you in tissue paper so it arrives at the destination with minimal creasing and ready to be worn. We can also supply the dress in a full-length hanging bag or supply specially designed Travel Boxes (Price on request). What happens if my dress needs altering? When do I collect my Gown? 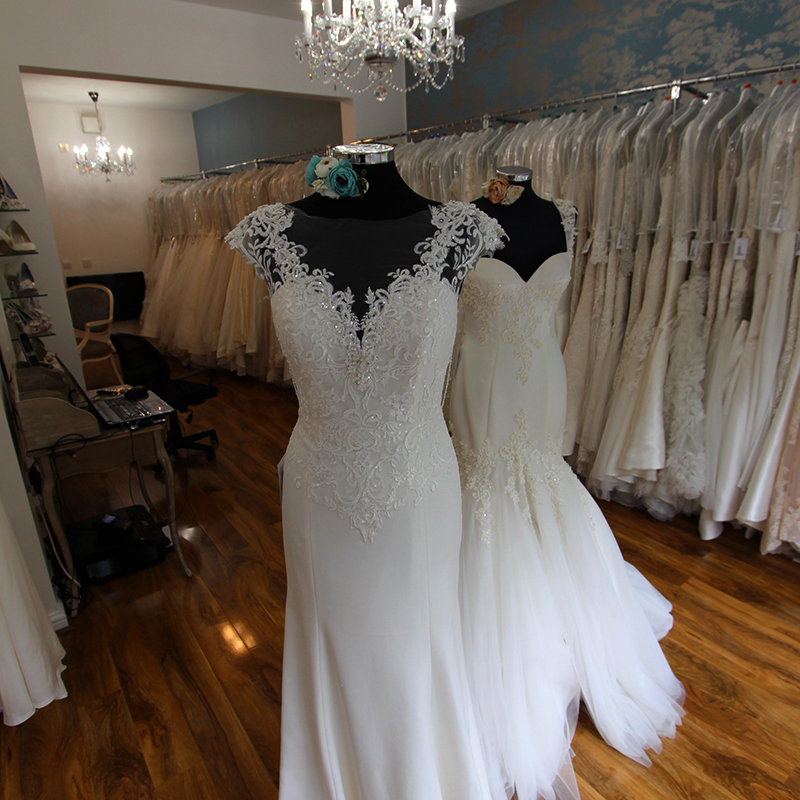 We have a specially built in-store stock room & can hold the dress for you until the week of your wedding. The gown will be steamed or pressed so it is ready to be worn and on collection it will be put in Gown Cover to protect it.